My personal and professional blog. I just wanted to write an update on some of the projects I have listed on my site. I am in the process of re-writing the site. I am going to try an AngularJS application for this. The site is currently down because my web provider has been so unreliable lately. I am moving it to Azure. I have already transisioned this site to Azure and everything looks good so far. Since I am using my own domains Azure will cost me more than my old provider but at least it will be reliable. I will post updates on the development of the site as I have them. I hope to have something at least up by the end of this weekend. I was initialiiy working on this application as a Windows Phone 7 application. Well it has been very slow going. I am now working on making this a Universal Windows Playform (UWP) application. That way it will run on Windows 10 and Windows 10 Mobile. This is an application I am slowly working on to help document and track permits for people like electirical, building and plumbing inspectors. I haven’t given up on it yet. Just haven’t had time to work on it. There is alot of comments about not having time. That is something I hope to fix this year. I have so much I want to do and so much I want to still learn. I need to find time, but when I do find time I sort of feel bad for not working on projects for work. I do need to keep the lights and the internet on. Well here is hoping for a good year of geting stuff done. So I really want to do a Windows Phone 7 HAM application and I am looking for comments on what people would like in that application. Give me some suggestions. I am working on a small Morse Code training application currently, but I am thinking something more. A mobile log that will send data back to home and sync with your log at home? 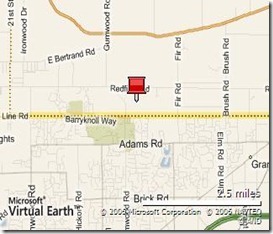 A repeater lookup so using your GPS location it will tell you what repeaters are in your area? So please speak up and comment away. Let me know what you would like in an application. Yes I know with the Internet speeds you can get hooking your computer up to your cell phone why would you want to do 1200 bps or 9600 bps over radio? Well I tell you why, because it just sounds cool and is something I haven’t done before. This could also come in very handy in an emergency situation where all the cell towers could be down. I can always rely on my HAM radio equipment. After a little trial and error I was able to get it up and running using the RJ-45 connector on the ULI and the 6 PIN DIN on the FT-7800R. Here is the wiring layout that I used to connect the ULI to the FT-7800R. Depending on the speed of the packets you want to send you would connect PIN 4 or 5 from the FT-7800R to PIN 3 on the ULI. The ULI uses a standard RJ-45 connection and the PIN layout starts from the left. I am running this on the same computer as my WiRES-II system. I installed a second sound card, and to not cause any conflicts I am running VMWare Workstation 6 and Windows XP Pro inside the VM. VMWare allows me to chose which sound card the Virtual Machine will use and this doesn’t cause any MIC or Speaker conflicts on the sound cards and each can be configured independently. 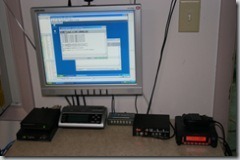 I am currently using AGWPE as my packet engine and I am using WinPak as the packet radio program. It rides on top of AGWPE. I haven’t done much with this yet, but I am hoping to get more involved with some people here locally that are doing this type of stuff. Last weekend I also finally mounted my antenna a Diamond CR8900A 29/50/144/440 antenna on the roof this weekend. It has been sitting just outside my basement door. I know this probably isn’t the best base antenna, but for now it is working. I don’t know much about antennas so any suggestions would be great. 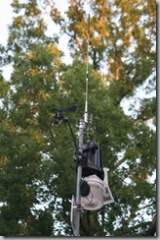 My antenna is up on the same tripod as my Davis Vantage Pro2 system. It is the tallest point I have right now. Well I finally got everything setup and running. My server ID is 1468, and it is running in simplex mode on frequency of 433.125 MHz and a tone of 94.8. It is running from a tower on my roof, so not the greatest footprint, but it is a start. 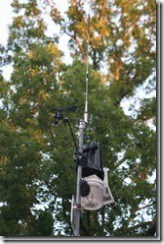 To get a list of active WiRES-II stations click here, http://www.vxstd.com/en/wiresinfo-en/activelist.html. There were some problems along the way and getting information from Yaesu was like getting your teeth pulled. I would also like to thank WD7F John from Arizona for helping me fix some problems in my configuration and tolerating me tying up his repeaters. 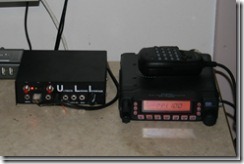 One of my problem was trying to figure out how to connect the HRI-100 to the FT-8900R. Every diagram I have seen on how to setup WiRES-II shows the configuration I have, so you would think it would include everything you would need to connect these 2 devices. However when you get the HRI-100 it doesn’t include the expected cable. It does include a 8 pin DIN connector with about 2′ of wire, so I ended up having to order the CT-39 packet connector for the FT-8900R. This is a 6 pin DIN connector with again about a 2′ of wire. You would think that after getting all this hardware that it should go together in a snap. Well you would be wrong. I couldn’t find anywhere online where there was a wiring diagram on how to connect the HRI-100 to the FT-8900R. I just couldn’t believe that the configuration they display doesn’t have a wiring diagram. Well I emailed the support email on the WiRES-II web site, and would you believe the email address they have for the US is a bad address, so that was no help. After about a week of emails to any address I could find I finally emailed the main customer service email on the Yaesu site complaining about the lack of support, and would you believe the next day I got an answer to my email. I finally got my wiring diagram got everything connected together and it wasn’t working. The system wasn’t transmitting, so I rechecked my connections and I did everything that they showed. I reviewed the packaging of of the CT-39A and I noticed that the PTT line wasn’t connected in their diagram. I thought that was strange so I decided to wire the PTTs together and see what happened, and would you believe it worked. I finally had WiRES-II transmitting and receiving on the Internet and on my local radio. Well I hope that can help someone out there. Where my headache can be someone else’s joy and easy setup. You would think that this would be the worst of it, but you would be wrong. I can’t believe in this day and age that to sign up for an Internet based service you have to snail mail in your application. I don’t understand why I can’t fill out this application online and then within a few hours I should get my server ID. I sent in my application and about 10 days later I got an email with my server ID. The software I had was older so I went to the web site to download the newer version. To access the download site you need your server ID and the serial number of your HRI-100. Well my login wouldn’t work, I couldn’t login to the download site or sign-in to the older software that I already had. The serial number that they had was wrong. Several emails and many hours later they fixed my serial number on their servers and everything was working. All that said I am pretty happy with the setup, it is nice to see a manufacture make a full Internet solution. I do have a couple suggestions that I would like to see. First I would like to see them put user forums on their WiRES-II web site. Their email support is so slow and user forums could really help. I would also like to see them make the software compatible with EchoLink. There should be no reason they couldn’t do this and it would really widen the reach of a WiRES-II system. WiRES-II isn’t very popular in the US, so I may have to switch to EchoLink down the road. I may see if I can cross connect them myself on the same radio and computer, but I am not sure if all this will run on one computer with multiple sound cards. Well I just got my HAM radio license KD8FWV. This is something I have wanted to do for years. My dad WA8MNF has been a ham for as long as I can remember. Since they have removed the Morse code requirement from all the levels I figured it was about time. I only have my Technician right now, but I am thinking I want to go all the way to Extra. Not sure what else I will do with it but I am looking forward to learning new stuff. I am really excited to see what I can do with my computer and my radio. For my first radio I purchased a Yaesu VX-7RB. I purchased it from www.hamcity.com, and I would have to say I would high recommend them. When I purchased my radio I accidently ordered an extra belt clip. They emailed me before they shipped the order and told me about the problem and credited my credit card the money for the extra belt clip. I have on order everything to setup a WIRES-II (Wide-coverage Internet Repeater Enhancement System). I purchased a FT-8900R and a HRI-100 to get my radio on the Internet. 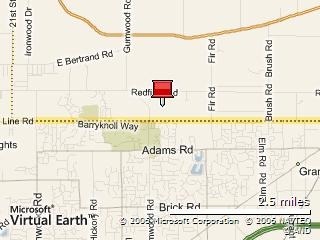 I haven’t gotten them yet; the FT-8900R is on back order. I should get them this week and I am pretty excited to get this up and running. I will get pictures and more information about my WIRES-II site up when everything is up and running.